Many patients associate “root canal” with pain. In fact, this procedure is about pain relief. Toothache/tooth pain is commonly due to the buildup of pressure inside an infected tooth. When the nerve is damaged, conventional fillings won’t stop the pain. 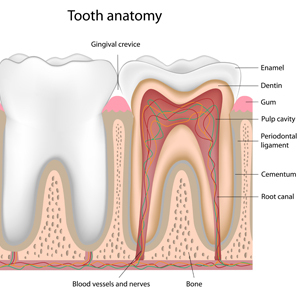 The answer is to remove the nerve within the tooth without removing the tooth itself. That’s what a “root canal” does, and opening the tooth’s interior (the pulp chamber) relieves the discomfort almost immediately! Please Note: sometimes infection can be present even if there is no discomfort. In these instances, infection/decay is identified with the help of dental X-rays. To perform the root canal, we remove the diseased nerve from within the tooth while the patient is under a local anesthetic. A tooth can have one to four canals, and all of the canals must be treated. After the tooth has been cleansed internally, a special material is placed inside to prevent further infection. Remember: when you arrive at the office for this procedure, the pain is behind you—not ahead. Root canal therapy has a high degree of success, although we cannot always save the tooth. Depending on the extent of the infection, a follow-up appointment may be necessary, and patients may also be prescribed antibiotics. After the procedure, patients may take over-the-counter painkillers if soreness remains, though discomfort at this stage is typically very minor and should subside in a day or two. At a following appointment, the treated tooth requires a permanent restoration such as a dental crown to provide stability and safeguard the tooth. With the crown in place, it will be indistinguishable from the surrounding natural teeth and can be used normally for biting and chewing. Who Needs a Root Canal?